Welcome to our series #CartedByT30, where experts, influencers, and anyone who just really knows how to nail down a grocery list show us exactly what goes in their grocery carts each week. Tune in to our Instagram Story on Sundays to walk down the grocery aisle with them, and then shop out the products here. 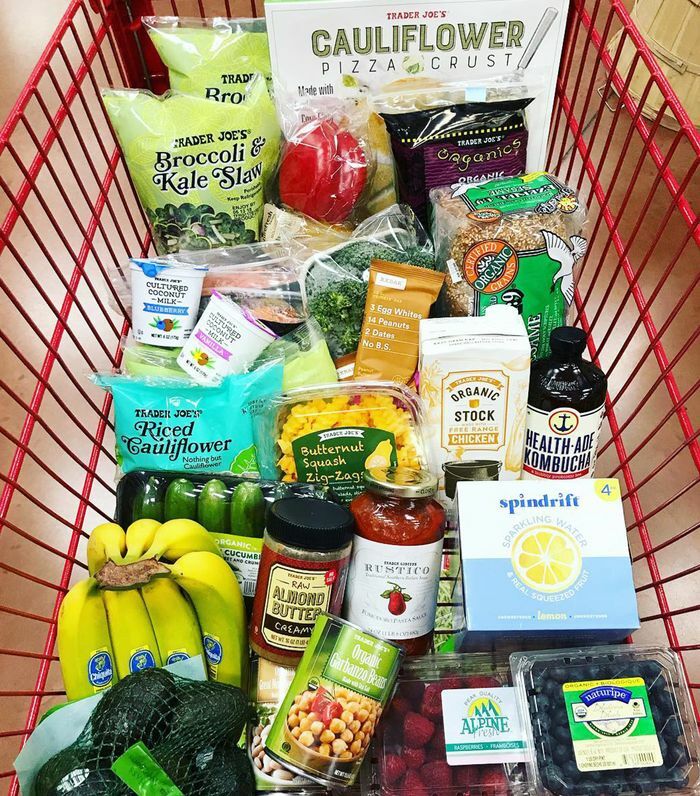 This week, behavioral health advisor Kelley Hoag is taking us through all the dinner staples she adds to her Trader Joe’s cart. Like most green veggies, asparagus is a nutritional powerhouse. It’s packed with fiber and folate, and serves as a natural diuretic, which can aid your body in getting rid of excess fluid and salt. For me, it’s a tray-dinner staple! Similar to asparagus, broccoli is a great fiber source—meaning it will help you stay full and maintain healthy digestion. Plus, crispy, roasted broccoli is so satisfying. Yes, sweet potatoes are a starch—this is true. Because of this, my clients are often turned off by them if they’re trying to lose weight. But it’s important to note that they’re actually a resistant starch. They stabilize your blood sugar, which keeps you full longer and helps feed the good bacteria in your gut. Try roasting and having them on their own or dipping them in almond butter: my all-time favorite snack! I personally love onions and think they elevate most dishes. Throw ’em on the tray, in a scramble, on your salad… The options are endless. Chickpeas, garbanzo beans—call them what you want, but they’re an unlikely addition to an easy dinner. A half cup of chickpeas contains about 7 grams of protein and 7 grams of fiber. Roast them on the pan and they’ll get a bit crunchier (and be easier to digest). TJ’s has really great wild-caught salmon. Pro tip: Get the frozen one. It’s the same quality as the refrigerated version for a bit cheaper, and all you have to do is let it thaw before you’re ready to prepare it. This guacamole has only clean, delicious ingredients, so it’s always in my fridge. I’ll dip carrots into it, use it as salad dressing, or put it on the side of my tray dinner to get in those healthy fats. Avocado oil has a higher smoke point than olive oil, which makes it a better option for roasting since the oven should be about 375ºF or above. Get yourself the spray version and it’ll make cooking even easier. I recommend roasting your choice of protein and these chopped veggies in the oven at 375ºF for 35 minutes with your favorite seasoning; then add your fat once it’s plated. Dinner is served! Next up: the healthy items I always buy at Trader Joe's (for less than $50).